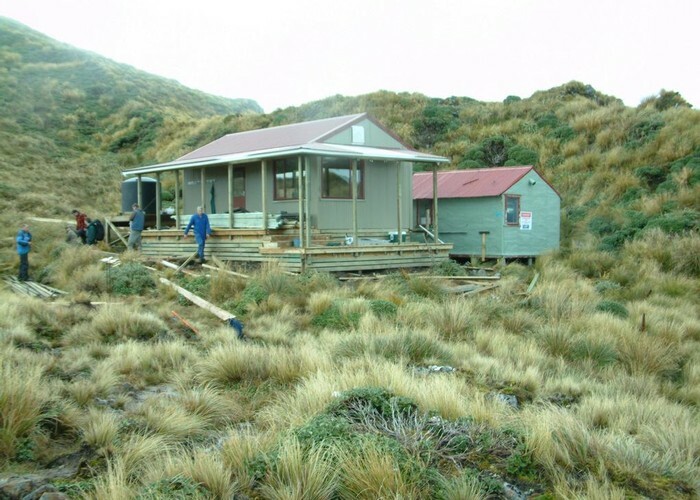 This was taken when inspection being carried out by DOC Engineer , Allan Dallas (blue overalls)just prior to completion of new hut.Bloke on left with blue jacket is Jason Diederich ,Chief Pilot ,Amalgamated Helicopters Ltd. Building contractor Evan Mardell. monkeysh1ne What arare treasure of a shot! How often have I seen old and new huts intact in same shot!? Brilliant! Added 8 October 2011 by OldGoatOldGoat. 1 revision 20 November 2011 by OldGoatOldGoat.